Okay, well I didn’t exactly paint it myself I had my favorite painter Victor paint it for me, which made the process even more fun. 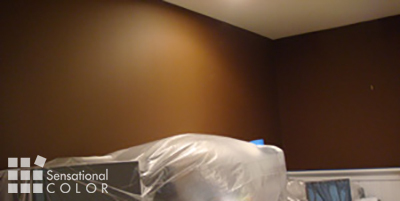 Here’s a shot of the current chocolate brown walls. They looked great above the white wainscot when the former office occupant had the room decorated with an equestrian theme but I wanted a lighter more open feel. For the walls I wanted a perfect neutral plus a color that reflected my personality. 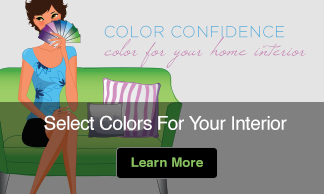 This was a tall order and I had considered several options but when I came up with ‘H2 Ahh!’ as my signature color for Full Spectrum Paint’s Designer Palette I knew I had the color I was looking for! In the picture below Victor is just getting started. 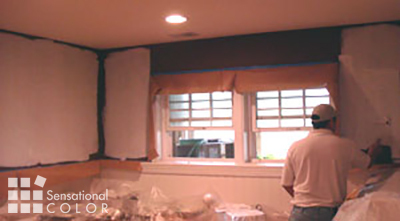 I wanted to make sure that there would not be any hint of brown showing through so I had him start by covering the walls with Valspar Interior High Hiding Wall Primer. 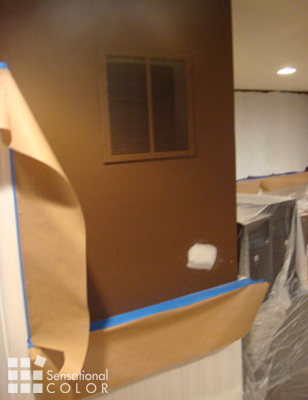 You can see on the background wall how well this has covered the brown with just a single coat and works much better than an extra coat of regular wall paint. I have to admit that having someone else paint is great especially if you can find someone that does as nice a job as Victor does. While I took my MacBook Air out for coffee he continued painting. The most difficult part of this process for me was having my neatly organized office discombobulated and covered in plastic. Below is a picture of the office as he is getting close to being finished. This picture doesn’t even begin to show how beautiful this color looks. It is actually very similar to Restoration Hardware’s ‘Silver Sage’ but better. 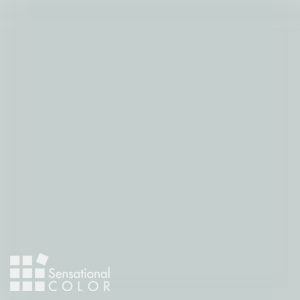 I think I bought one of the first gallons when RH started selling ‘Silver Sage’ and painted my bedroom so I have lived with this color for years, seen it in every light and contemplated the color for hours and decided for it was just about the perfect wall color for me. The one thing I didn’t care for was that in low light the color could seem flat or lifeless. Last night I spent some time simply experiencing the ‘H2 Ahh!’ in low light and I think this problem has been solved. By developing the hue using the full spectrum of colors and eliminating black pigment from the mix it doesn’t seem to lose its beauty. This is very exciting and after a few more evenings of confirming that we ‘got it right’ I’ll probably be repainting my bedroom. I had both the walls and ceilings painted with ‘H2 Ahh!’ and the space already feels more spacious and as if the ceiling height has been raised. As soon as I pull it back together and re-hang the artwork I’ll post a picture so you can see how it looks. The magic of color never ceases to amaze me. What do you love about the color of your surroundings. I’m currently living with friends and my bedroom has wainscoting and a similar color blue. It is really a fresh and uplifting combination. Fresh and uplifting…great words to describe the way I’m feeling today in my freshly painted office. Kate, I am so glad you are enjoying your H2 Ahh! 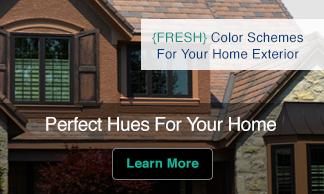 It has become our most popular new color! I always tell people you can’t judge a color until the paint job is completely finished and everything is back in place. But this is such a transformation. 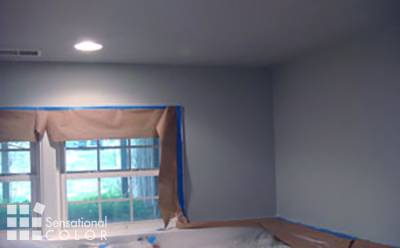 I’m especially pleased you are seeing how painting the walls and ceiling (where there is no crown molding) visually raises the ceiling height! I’m going to have to send all those clients to your site to see those photos for themselves. I’m always recommending this but for many it’s hard to imagine. Thanks Ellen. The color is perfect! As for putting up the artwork…I agree. I’m already thinking I’ll hang less and enjoy the color more. Must admit I hadn’t seen this entry until Julie included a link to it in her entry on pjs. Had to see the color that matched her choice for you. I have to say I love it and it fits you so well.